Our new Therawrap2 Collection combines individually wrapped coil technology and luxurious fabrics with the durability of our traditional 2-sided design. 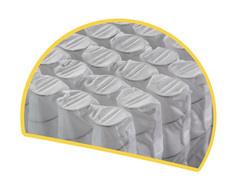 This combination helps to provide conforming support and eliminate motion transfer on both sides of the mattress. This ensures that both you and your partner will enjoy an undisturbed night of restful sleep, and that your mattress can be flipped so you can enjoy it for many years to come.